Different people on your team build and market different parts of your product, so it makes sense to collaborate on your docs and let experts write everything they know about each feature. The Owner role is automatically assigned to the creator of the account. This role can do everything, including manage billing. Owners can't be deleted, but we can transfer ownership if you need us to. Users with an Administrator role can do everything too. They can manage HelpDocs settings, billing, branding, and add/remove users and API keys. They can also edit all articles and content. An Editor can see stats and manage content, but can't edit any settings or branding. Users with this role can only view content. This is usually paired with the Restrict to Logged In Users auth option. 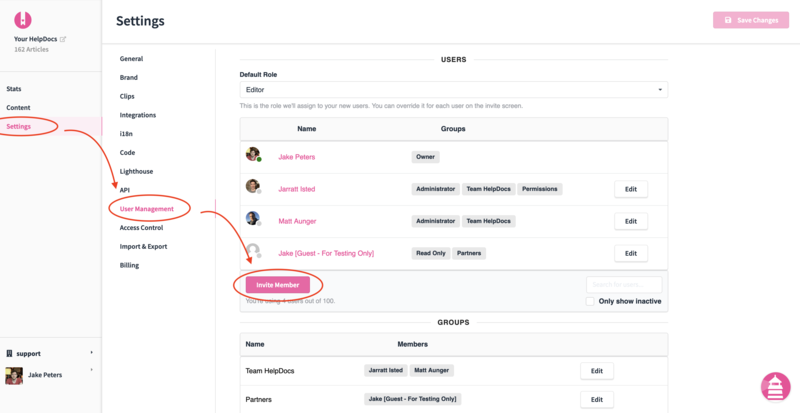 When you invite a new team member in Settings > User Management, they'll automatically be assigned a specific user role. You can change the role they'll be assigned. If you're the owner of your account, you can transfer ownership to any other user. 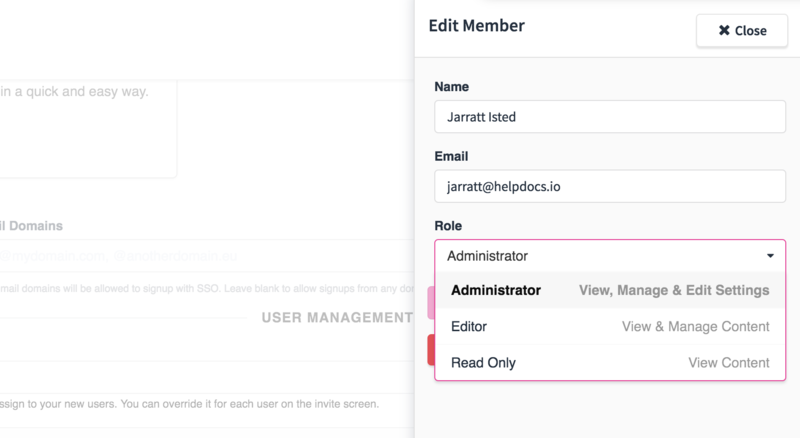 You'll see an Owner role in the dropdown where you select user roles. Select that, hit Save Changes, and that user will be your new account owner. Once you transfer your account to a new owner you'll become an Administrator instead. There's no way to reassign ownership to yourself later on. If you transfer ownership by mistake, contact support in-app as soon as possible. In the corner of each user's profile image in the users table you'll see a little dot indicating their status. If the user is currently online, that dot will be green. If they're offline, that dot will be grey. You can hover over an offline user's profile image to see when they were last active.